Here’s a killer deal on a Front Focal Plane (FFP) optic good for PRS competition and tactical applications. The Vortex Viper PST 4-16x50mm scope features 0.1 Milrad clicks with an EBR-1 illuminated reticle with Mil-based hash marks. There are 21 Mils of Elevation amd Windage. The scope is 13.7 inches long, has a 30mm main tube, and weighs 22 ounces (without rings). Not that long ago, this scope sold for around $900.00. Now you can get the Vortex Viper PST 4-16x50mm for just $599.99, a $300.00 savings. That’s a steal for a PRS-ready FFP comp scope with a proven track record and rock-solid Vortex warranty. EuroOptic’s listed Sale price is $599.99 for the Viper PST 4-16x50mm. 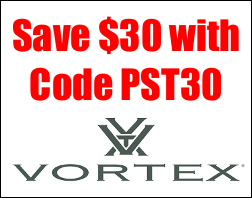 However you can an additional $30 off with Code PST30. That drops your net price to just $569.99. You need to act quickly — this Promo Code expires on 9/30/2018. 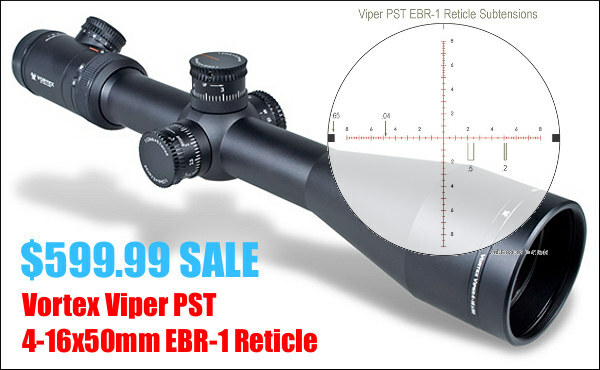 Share the post "Great Deal on Vortex Viper 4-16x50mm FFP with EBR-1 Reticle"